But the combination of interminably long lines, few sparkles of on-the-ground humanity, robotically-chirpy volunteers and limited green space left many visitors, local and foreign alike, underwhelmed. Furthermore, the Shanghai government did precious little to entice foreign travelers. Its public relations efforts -- a bizarre fusion of propagandist "bureaucrat-ese" and brain-dead imagery dominated by an omnipresent, neotonized, pale-blue creature named "Hai Bao" -- ensured overseas figures remained below projections of (only) 5 million people. According to meticulously orchestrated closing-day news reports, Shanghai Expo was all about a 21st century global village for which China had morphed into a beatifically-smiling citizen. As the Shanghai Daily wrote, "For the past six months, the Expo site was a place where people could see rare cultural treasures from around the world -- such as the Bronze Chariot and Horse sculpture from China's Qin Dynasty, the statue of Athena from Greece and the masterpieces of French Impressionist artists -- and also get a taste of the world's diverse cultures through more than 20,000 events." The central and municipal governments, despite pervasive bilingual signage and visitor booths scattered throughout the city, had its eyes focused squarely on domestic concerns. 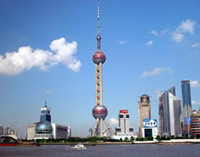 With these objectives as benchmarks, however, Shanghai Expo 2010 was a success. In China, everything is a means to an end. Shanghai Expo was conceived and executed to catalyze a host of internal breakthroughs. Most importantly, in a system riven by political factionalism and ever-present fiscal competition between central, city and district-level organs, the event forged order from chaos. Petty, bottom-up, back-room infighting was supplanted by top-down, command-and-control decision making. In the years leading up to Expo, infrastructural breakthroughs -- ten subway lines, several bridges and a new ring road, high-speed trains between Shanghai and neighboring cities, massive real estate/retail developments for which eminent domain concerns were swept aside -- were unveiled with clock-like efficiency. To boot, a massive clean-up effort has left behind a sparkling urban landscape. Store signage has been upgraded, roads have been repaved and sidewalks are infinitely more walkable then even a year ago. China's Everyman has been impressed with the government's ability to, yet again, mobilize resources for large-scale projects. Despite clumsy efforts at behavior modification -- illegal DVD shops went further underground, cigarettes (well, at least ashtrays) were banned from many restaurants, slogans promoting "civilized" behavior were everywhere -- the population fell in line. (I issued a plea to "forge a harmonious society" during Expo when my lane house neighbors placed trash outside my door. It worked.) Work units, government teams, senior centers and high schools made pilgrimages to the fair ground by the busload. Very few grumbled. Wide-eyed smiles and a lack of cynicism were hallmarks of a hundred thousand forced day trips. Opening and closing ceremonies, bereft of spontaneity or joy, nonetheless rivaled Beijing 2008 in terms of scale and pageantry. And the fairgrounds themselves, while sanitized to the point of Stepfordization, were colossal, epic in every sense. Waiting in interminable lines, the masses oohed. Finally, Chinese citizens were impressed with the government's ability to cajole foreign leaders to acquiesce to its demands, a harbinger of the Middle Kingdom's 21st century superpower status. Every country -- from America to Russia and Croatia to Nigeria -- fell in line. No one dared not to participate. China's ability to coerce foreign leaders to bend to its will, even for a second-tier international event, reassured the hoi polloi. In the end, Shanghai's World Expo was not an international event. It was orchestrated as a domestic power display, in the same vein as the country's 60th anniversary military parade and this fall's Asian Games. The government's goal was a Herculean projection of organizational mettle and global stature. Despite acute awareness of the game their government was playing, the Chinese -- even, grudgingly, the anti-Shanghai Beijingese -- acknowledged the job got done.